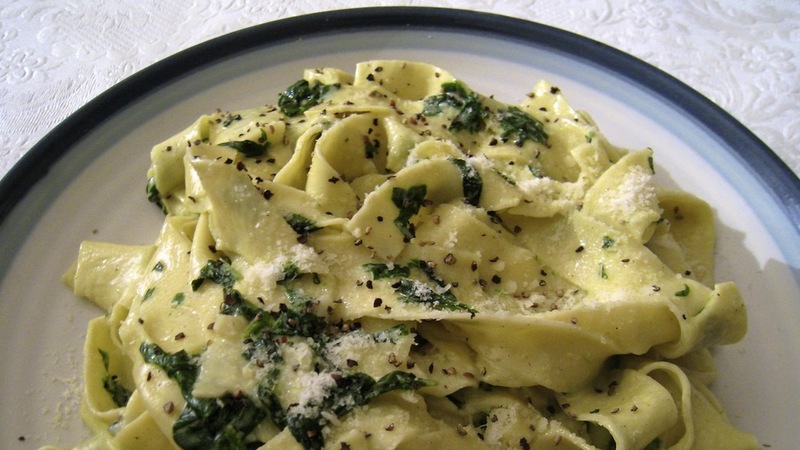 2 teaspoons butter2 cloves of garlic, peeled and sliced ½ a nutmeg, freshly grated 400g/14oz fresh spinach, washed thoroughly and finely sliced sea salt and freshly ground black pepper 120ml/4fl oz double cream 150g/5oz mascarpone cheese 2 handfuls of freshly grated Parmesan cheese 455g/1lb tagliatelle or spaghetti olive oil Bring a large pan of salted water to the boil, add the pasta, and cook according to the packet instructions. Meanwhile get a frying pan or wok warm, add a drizzle of olive oil, the butter, garlic and nutmeg. When the butter melts, add the spinach. After 5 minutes it will have wilted down and will be nice and dark. A lot of the liquid will have cooked away and you'll have wonderful intensely flavoured spinach. At this point season with salt and pepper until it tastes good, then add the cream, mascarpone and a little ladle of cooking water from the pasta. Let this come to a simmer and then season again. Drain the pasta, reserving some of the cooking water, then stir it into the spinach sauce. Add the Parmesan and toss everything together. Loosen to a nice silky consistency with some of the reserved cooking water, so it doesn't become too claggy. Check once more for seasoning and serve straight away.